Google “Shakespeare on your feet” and the first page of search results will reveal that entities from libraries like the Folger, media outlets like PBS, and theatres like the Actors Centre advocate teaching Shakespeare “through play” or “up on your feet” or “actively”. At the ASC, we certainly use that language as well, but the driving idea behind our approach is more about context than the work we see elsewhere. Context is a term we take very seriously; it involves more than asking students to build models of the Globe or talking about Elizabeth’s life during the era. It really comes down to teaching our teachers and students to think like Shakespeare’s actors did when they approached the text. 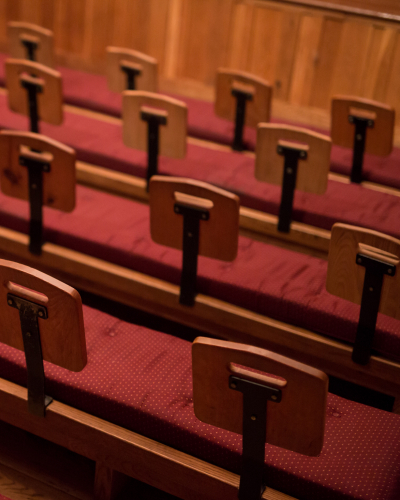 Look around you and see the wooden platform, the audience in the light, the clues in the text (for those who don’t have a lot of time to rehearse), so that performance of the words is at the top of students’ minds. Setting The ASC acknowledges that most of the teachers we work with operate in English classrooms which feature desks, and that there is some difficulty in getting open spaces in many schools. So our lessons work within those parameters. We believe that learning is individualized, so students can learn most deeply in situations which allow inquiry. We advocate for desks arranged around a playing space to invite the exploration of scene, arranged in thrust so that students are closer to Shakespeare’s theatre’s architecture. We advocate for avatars and actors to demonstrate and help define the information but do not advocate that all students must be on their feet at the same time — something that is difficult to do in an English classroom and is not conducive to all students’ engaging with the text in context. Frequently, our colleagues’ lessons require a wide open space so that all students can be up and active simultaneously. Teaching assumptions The ASC realizes that the vast majority of teachers working with students on Shakespeare’s plays have had few classes on the subject and are not versed in theatrical techniques (nor do many want to be; they teach English because it is their passion). We believe that teachers desire to deepen their own learning and knowledge in order to deepen their students’. We recognize that they have limited time in which to add to their knowledge, so we strive to make every minute that they spend in our professional development programs immediately applicable to classroom practice and to their own and their students’ enrichment. We take the approach that if teachers know more about how these plays work and worked on the stage, they will have a richer understanding of why the plays are worth studying and be able to communicate to a diverse body of learners. Many professional development programs spend a lot of time teaching 21st-century theatre techniques; these do not give insights into the works Shakespeare wrote and are limited in scope — even within professional theatres. The time spent on those could be used to connect Shakespeare to his theatrical practices so that we understand the ins and outs of what his actors saw on the page, rather than giving English teachers modern day theories of how to instruct their students in the fundamentals of acting. Context We believe that context is everything. Context means we believe in treating the plays as plays, plays that were written for specific theatrical conditions that students benefit from knowing, and leaving the text in place in the lesson. This means that we do not employ “insult generators” or pull lines out of speeches to “throw them at each other”. We do not advocate for separate lessons on Shakespeare’s biography, but fold the fact that he was a working actor into every exploration and note that his monarch and the political climate of early modern London may have had an impact on this character or that scene, as it arises. We consider the staging conditions he considered, as a means to get the students and teachers we work with closer to the performance Shakespeare imagined as he wrote the plays. Many in our cohorts take lines out of context to “show that Shakespeare isn’t hard”, in arenas like “Shakespearean insults” games or “text lay ups”. We believe that removing surrounding text achieves the opposite goal and says to students that “Shakespeare is too hard for you to understand unless I take it out of the play.” We think that students will enjoy the connections between Shakespeare’s plays and his biography if direct lines connect them. We avoid assignments that advocate for set or light design for a play, since those projects fight the nature of the continuous action in early modern theatres. Teaching teachers We believe that teachers’ time is precious and that they learn the most from fellow educators — educators who have the time to prepare detailed and specific lessons and handouts that they can immediately deploy in their classroom. We model those lessons so that teachers can see one approach and adapt each activity to their own style and purpose. We arrange the lessons in an accessible way so that they can teach the unit in any order and blend the lessons together as they choose, but also provide a scaffolding section (The Basics) so that teachers have a baseline of knowledge from which to begin. We test the lessons and conduct focus groups, then we adjust them as needed, constantly improving the materials we provide and our approach to them. And, we enhance the lessons with feedback and input from our actors and the events that transpire in a rehearsal room, so that we are speaking truth and giving students and teachers the very important insights our actors share in classroom applicable ways. While many practitioners do provide outlines and handouts, the formatting and explanation is often insufficient for the busy teacher who is moving from teaching American Lit to Shakespeare or from one period to another. Often, the handouts skip important steps, attempt to cover too much, or anticipate too much knowledge as a baseline. 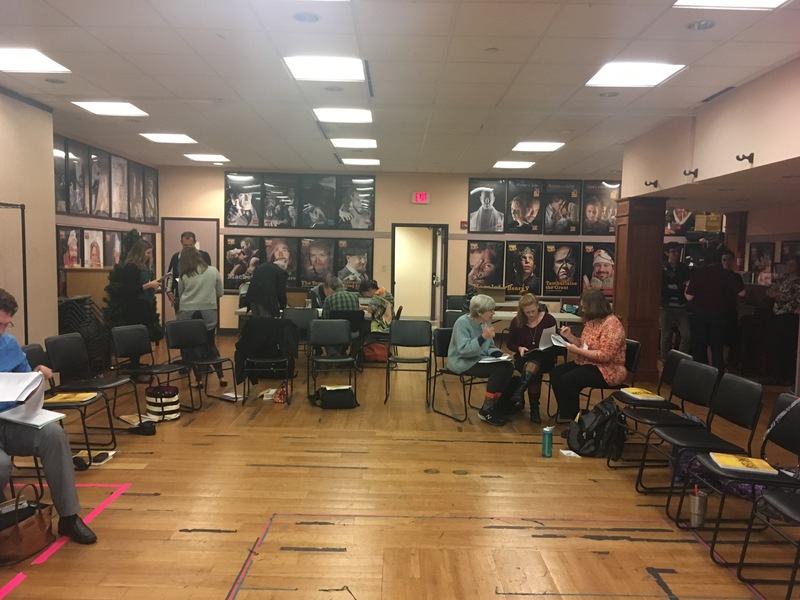 Moreover, actor talkbacks and director discussions take a large percentage of the time in some seminars at other theatres, while these sessions can be fun, the bulk of the discussion does not translate to classroom practice or a better understanding of the plays. (infinite variety) We create a world of many, many right answers, and we suggest a method of inquiry-based learning — where each student’s answer may differ. Shakespeare wrote incomplete works; he needed the actors he worked with and the audiences he played for to finish them. Students are the actors and audience, and they can answer the questions that lead to the infinite variety of choices that continue to make his plays fascinating 400 years later. We encourage students to consider a number of choices — if video comes into our lesson, we use several clips from many different productions to emphasize how many choices are available. Stating that a scene is “about” something or that a character is “some characteristic” and asking students to inhabit that idea features in many programs’ methodology. These opinions may be related to an instructors’ take or experience; however such approaches prohibit exploration. Using film in the classroom can be reductive, as it may limit the students’ idea of the play to one interpretation. Materials We provide teachers with materials that are complete and formatted for ease of use in the typical English classroom (black and white, because most schools copiers are not color; few pages dense with information to save paper; and we are working to envision more in the digital classroom — white boards, etc) I have seen handouts totalling 25 pages, with color, or difficult to read facsimiles or, worse, fluff activities (word finds, crosswords, quizzes — time killers, not enrichment activities) that do not bring students any closer to understanding Shakespeare’s work, nor its relationship to his life and theirs. In short, we aim to create an atmosphere of learning that makes gaining knowledge and engaging in exploration irresistible. A space in which students dread the final bell because they will have to leave the topic, a room filled with voices and opportunities to state one’s thoughts — while realizing that difference of opinion is beautiful and can be shared respectfully. A place where the learner can become the teacher and the teacher learns something every time the class convenes. We believe the way to do that is by empowering teachers, giving students agency, and providing them with tools to examine words and meaning that stretch well beyond the classroom walls. Even to a 400 year-old theatre, perhaps.